Every night, roughly eight million listeners tune in to hear the sultry voice of "Delilah" on the radio. Her show offers a mix of encouraging words, love songs and faith. CBS National Correspondent Hattie Kauffman visited Delilah at her home base in Seattle, where she speaks from the heart. On the radio, she says: "Sweetheart, just love him. Don't worry about what you're missing, 'cause like I said, I'm twice your age and you ain't missing a thing, honey." Delilah's night-time, call-in radio show is mostly easy listening music, accompanied by her comforting words for the broken-hearted. Delilah says, "The show, if you listen to it, it's really not about advice or me telling someone to do in so much as it is me, listening to somebody share their heart." She describes the show as, "sappy," and laughs, "corny, we play love songs. It's very syrupy a lot of times." It is syrupy and dripping with sweet success. Each night, the show gets 100,000 calls, and over 1,000 e-mails, all about love. Delilah says, "I believe that love is the very essence of life. That without it, we would perish. If you don't have love in your life, I don't think you'll live very long." Delilah's love comes from her seven children. She's a single mom; her kids range in age from 3 to 19. Her home life seems to be an organized chaos. But Delilah says, "Oh, there's nothing organized. Oh, no. I do not have an organizational bone in my body." Some people try to have an on-air persona to hide the real person. In Delilah's case, she says with a laugh, "The real person curses. That's about the biggest difference." Open and honest, Delilah isn't shy about sharing her disappointments and failures with listeners. They know about her and her love life. "Or lack there of," she adds, laughing again. She says she has not been lucky in love. "Most of the advice I share on the air about failed relationship is from personal experience," she notes. But she remains the optimist. She says laughing, "I haven't been unlucky in love because bad things just happen to me, It's because I make really stupid choices. So hopefully, we live, we learn. Some of us just learn a little later than others." Asked how her show differs from those of other radio hosts, like Dr. Laura, for instance, Delilah says, "I've only listened to Dr. Laura once. And it made me very sad because I agreed with what she was saying. "But I didn't agree with the way she was presenting it. I don't receive advice or direction if someone is yelling at me. Or berating me or making me feel foolish. But when somebody comes to me in love and says: 'I care enough about you to show you that you're really messed up. You're really doing some stupid things.' I receive it." So on her show, you won't find tough love. No fire-and-brimstone preaching. What Delilah is dishing up is her own version of comfort food. An example? "If you started your day early and you're feeling kind of beat up by life, go fix yourself a bowl of ice cream and stay tuned. You're listening to Delilah," she says on the radio. 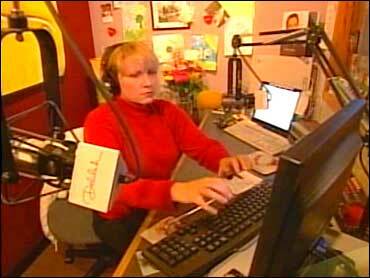 Delilah's nationally syndicated radio show can be heard late in the evening in all 50 states.